Speculative map of the mythical Lake Xarayes. Carte du Paraguay et partie des Pays adjacants. A beautiful example of Rigobert Bonne's 1771 decorative map of Paraguay. 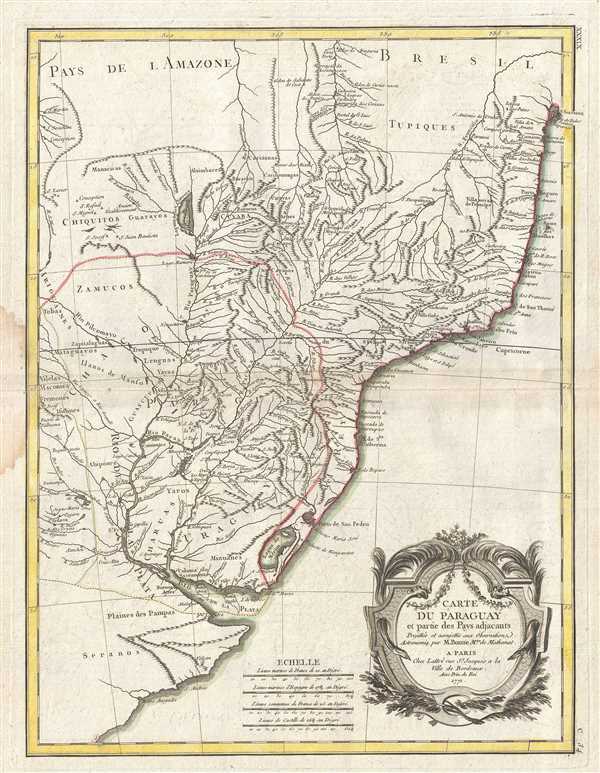 Covers from the Rio de la Plata north well into Brazil and the Amazon, extends westward as far as Cordova, and eastward to San Salvador, Brazil. Includes the modern day nations of Uruguay, Paraguay, and parts of adjacent Brazil and Argentina. Offers excellent detail throughout showing mountains, rivers, national boundaries, cities, regions, and tribes. Identifies Buenos Aires, Rio de Janiero, and numerous other important South American cities. Perhaps it most interesting element, this map offers a classic representation of the apocryphal Lake of Xarayes at the northern terminus of the Paraguay River. 'Xarayes' is a corruption of 'Xaraies' meaning 'Masters of the River.' The Xaraies were an indigenous people occupying what are today parts of Brazil's Matte Grosso and the Pantanal. When Spanish and Portuguese explorers first navigated up the Paraguay River, as always in search of El Dorado, they encountered the vast Pantanal flood plain at the height of its annual inundation. Understandably misinterpreting the flood plain as a gigantic inland sea, they named it after the local inhabitants, the Xaraies. The Laguna de los Xarayes almost immediately began to appear on early maps of the region and, at the same time, almost immediately took on a legendary aspect as the gateway to El Dorado. A large decorative title cartouche appears in the lower right quadrant. Drawn by R. Bonne in 1771 for issue as plate no. C 34 in Jean Lattre's Atlas Moderne. Lattre, Jean, Atlas Moderne ou Collection de Cartes sur Toutes les Parties du Globe Terrestre, c.1778. Very good. Some toning and wear along original centerfold. Minor foxing. Original platemark visible. Minor offsetting. Dampstain over left margin centerfold. Rumsey 2612.079. Phillips (Atlases) 664. National Maritime Museum, 215.